Author A.J. 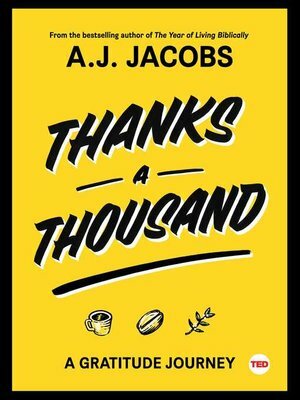 Jacobs discovers that his coffee—and every other item in our lives—would not be possible without hundreds of people we usually take for granted: farmers, chemists, artists, presidents, truckers, mechanics, biologists, miners, smugglers, and goatherds. By thanking these people face to face, Jacobs finds some much-needed brightness in his life. Gratitude does not come naturally to Jacobs—his disposition is more Larry David than Tom Hanks—but he sets off on the journey on a dare from his son. And by the end, it's clear to him that scientific research on gratitude is true. Gratitude's benefits are legion: It improves compassion, heals your body, and helps battle depression. Jacobs gleans wisdom from vivid characters all over the globe, including the Minnesota miners who extract the iron that makes the steel used in coffee roasters, to the Madison Avenue marketers who captured his wandering attention for a moment, to the farmers in Colombia. Along the way, Jacobs provides wonderful insights and useful tips, from how to focus on the hundreds of things that go right every day instead of the few that go wrong. And how our culture overemphasizes the individual over the team. And how to practice the art of "savoring meditation" and fall asleep at night. Thanks a Thousand is a reminder of the amazing interconnectedness of our world. It shows us how much we take for granted. It teaches us how gratitude can make our lives happier, kinder, and more impactful. And it will inspire us to follow our own "Gratitude Trails."